In September, I attended the International Food Blogger Conference. Lucky for me, it was in Seattle. It was a packed weekend of seminars on subjects ranging from food photography to sous vide, great food and meeting fellow food bloggers. Our keynote speaker was food writer extraordinaire, Dorie Greenspan. I want to be Dorie Greenspan. Oh heck, I eat too much pie to ever be waifish Dorie Greenspan….but I can dream! Ms. Greenspan splits her time between Paris and NYC. She has authored eleven books including Around My French Table, Baking with Julia, and Baking: From My Home to Yours. Ms. Greenspan noted she is lucky because she works hard and advised us to “always say ‘yes'” – even to things that terrify us. I’ve wanted to bake brioche for awhile now, ever since I had that apple filled brioche at The Bottle Tree Bakery in Oxford, Mississippi. Fortuitously, I’ve had Dorie Greenspan’s Baking with Julia sitting on my book shelf for many years and, of course, there is a recipe for brioche in it. So, inspired by hearing Dorie, I made the brioche. At the time I didn’t have those fancy fluted brioche pans, so I just used plain old loaf pans. 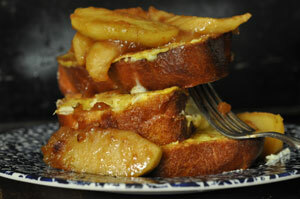 The brioche turned out fine grained, sweet and tasty; and it made excellent stuffed French toast the next day. Thank you Dorie! Make the sponge by putting the milk, yeast, egg, and 1 cup of the flour in the bowl of a heavy duty mixer. Mix the ingredients together with a spatula until just blended. Sprinkle the remaining flour over the top to cover the sponge and let rest uncovered for 30 to 40 minutes. The flour coating should be cracking after this rest period. Add the sugar, salt, eggs and 1 cup of the flour to the sponge. Mix in your kitchen aid with the dough hook on low speed for a minute or two until the ingredients are just mixed. Still mixing add the rest of the flour. When the flour is incorporated increase your mixer to manufacturers recommended speed for bread (for my kitchen aid that is 2) and beat for another 15 minutes. You can add up to 3 T. of flour if after 7-10 minutes you do not have a cohesive, slapping dough. Whack the butter with a rolling pin until it is the consistency of the dough, but not warm or greasy. While mixing at a low speed, add the butter a few tablespoons at a time to the dough. The dough will look like it is falling apart. Do not worry, keep mixing about 5-6 more minutes. If after 2-3 minutes it does not look like it is coming together add up to 1 T. of flour. When dough is done it will be soft and a little sticky and may cling to the bowl. Transfer to a large, buttered bowl, cover with plastic wrap and let rise at room temperature until doubled in bulk- about 2 1/2 hours. Deflate the dough, cover again with tightly with plastic wrap and refrigerate overnight or for at least 4 to 6 hours. Now, it is ready to bake. 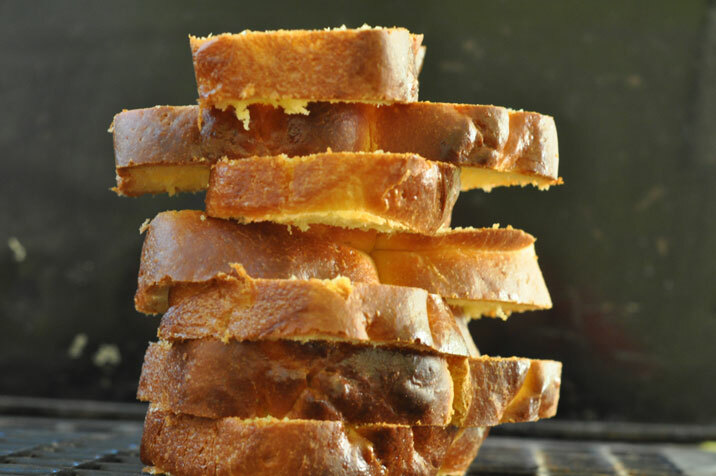 If using fluted brioche pans: use 3 large fluted bioche pans. Divide dough into thirds. Of each third, cut off scant 1/3 piece of dough. Roll larger piece into a ball and drop it into the buttered mold. Form scant 1/3 into a pear shape. Make a depression in the center of the dough in mold and fit the narrow top of the pear shaped piece into the depression. Pinch and press together so the seam is sealed between the larger dough and the knot. Repeat with remaining dough. Cover the pans with buttered plastic wrap and let dough rise at room temp until doubled - about 2 hours. Brush with and egg wash. Snip 2 -3 slits in each larger ball of dough. Bake for about 30 minutes at 375 degrees. If browning too quickly cover with foil tent. If using three loaf pans: Divide dough into thirds and then divide the third into six equal pieces. Shape each piece into a ball and place the balls into a buttered 8 1/2 x4 1/2x2 1/2 loaf pan so you have 3 rows of 2 balls. Repeat with the remaining 2 loaf pans. Brush with and egg wash. Snip a cross on each ball of dough. Bake for about 30 minutes at 375 degrees. If browning too quickly cover with foil tent.